President Duterte traces the last moments of life of the couple. From the local media the hypothesis that before the attack they had been sighted in a terrorist training camp. The silence of the population makes investigation difficult and the administration could offer rewards. In Zamboanga, unknown people throw grenade inside a mosque: two dead and four wounded. 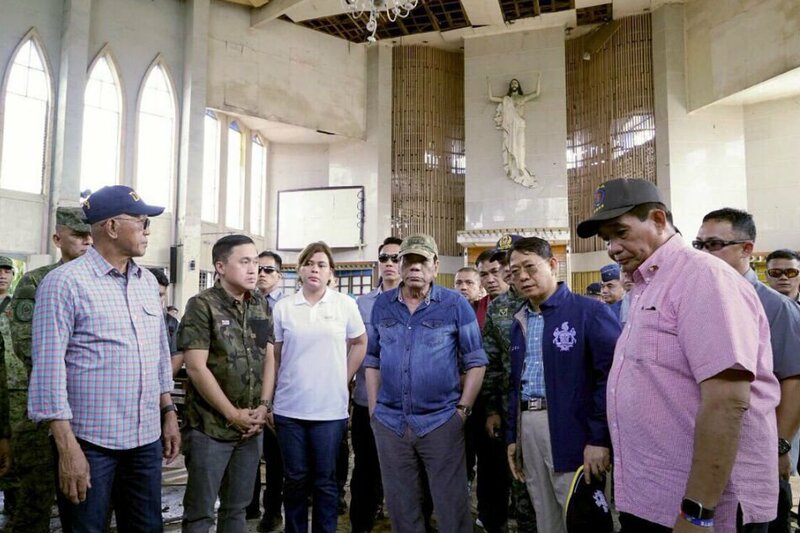 Manila (AsiaNews / Agencies) - The authors of the January 27 suicide bombing on the Cathedral of Our Lady of Mount Carmel in Jolo (Sulu) were a married couple. This was revealed by Filipino President Rodrigo Duterte, adding that "there is no doubt" about the fact that Abu Sayyaf, an armed group that has sworn loyalty to the Islamic State (IS) is behind the explosions. Meanwhile, 14 year old Chienly Camille Tabas Rubio's death in hospital brings the number of people who died in the jihadist attack to 21; among these there are several bodies not yet identified. 112 people are injured, 54 of whom need continuous medical assistance. In these hours, another episode is likely to ignite Mindanao. Early this morning, unknown people threw a grenade into the Kamahaldikaan mosque in Zamboanga City, killing two people and injuring four others. Army spokesman Col. Gerry Besana says that the first investigations are under way to determine if the action is linked to the January 27th attack. 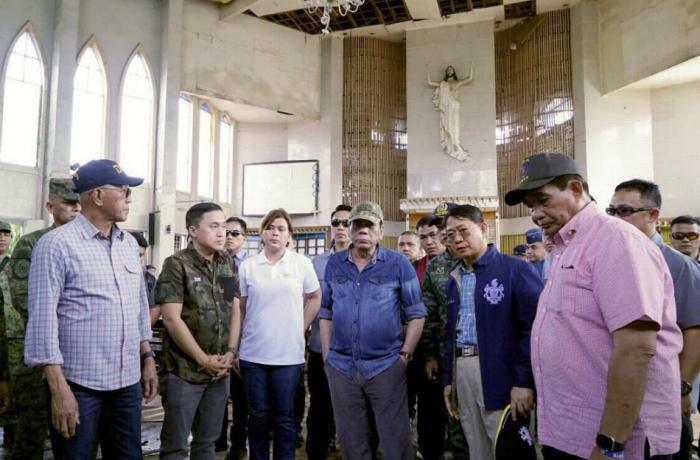 Two days ago, the Philippine president went to the scene of the tragedy (photo) and visited the injured at the hospital. Citing intelligence sources, Duterte yesterday retraced the last moments of life of the two bombers, confirming for the first time in an official capacity that the terrorists have committed the suicide attack. The woman, wearing a showy cross around her neck, entered the church and in the middle of the 8 o'clock function detonated the improvised explosive device (IED) she carried with her. As a female, the terrorist "did not raise suspicions" among the security personnel, the president says. Instead, the husband remained outside the cathedral, near the entrance. Outside the church, after the first explosion policemen and soldiers rushed to the scene and did not search him, allowing him to trigger the second explosion. Duterte declares that the bombers "may be foreigners" (perhaps Indonesians), but "the reports of the security forces on the matter do not agree" on their nationality. Local media put forward the hypothesis that the two had been spotted in a Abu Sayyaf training camp four days before the attack. The president states that "it is certain that for two years foreign terrorists have trained in Jolo", a historical Islamist stronghold in the area of ​​the island of Mindanao. For this, he had already sent a whole battalion of soldiers there. Delfin Lorenzana, secretary of the Defense of Manila, reveals that Duterte ordered the military and police to crush the militants of Abu Sayyaf"by any means". The minister adds that the president is thinking of imposing a cut on the couple's accomplices. "We hope - says Lorenzana - to be able to convince the locals to work with us to identify these people. It is difficult to trace them because it is just as difficult to get information. Local people do not talk to people who are not familiar ".